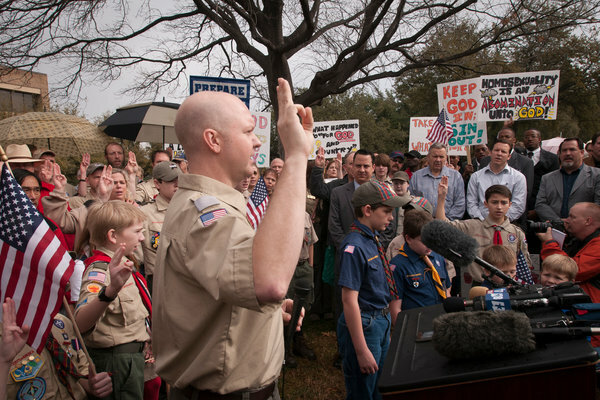 The Boy Scouts of America have decided to defer a decision on whether to change their longstanding ban on gays. Seems that pressure from troops sponsored by conservative religious groups has had the desired effect. The Supreme Court has held that, as a private organization, BSA is free to exclude gays from its ranks. Yet, BSA continues to receive special government benefits in terms of access to public land and buildings, transportation by military, and Eagle Scouts who enter the military service start out at a higher compensation level. So, the government is complicit in this discrimination. Public opinion has shifted against the ban, with a solid majority favoring the inclusion of gays and minorities. BSA was feeling the economic impact of that shift, as benefactors are starting to withhold support in protest. So, BSA leadership tried to walk the tightrope and implement a new policy that permitted troops to exclude gays without requiring them to do so. It wasn’t enough for many troops sponsored by conservative Christian churches, that they could continue to discriminate; they want all gays out of all troops Some have threatened to leave BSA to form a Christian scouting organization. And, as usual, practically nobody even mentions that BSA continues to ban atheists and agnostics who refuse to swear an oath to do their duty to God, denying many the benefits of scouting. I’ve said before that BSA is, overall, a wonderful program that teaches wonderful values to boys. I have coached kids who have been involved in scouting, some of whom have become Eagle Scouts, and they are without exception outstanding young men with whom I have been proud to associate. I also have good friends who were scouts as kids and who have remained active volunteers, and I know that they are doing wonderful work and are improving our community as a result. But, I am saddened when I see children dragged into protests that espouse hateful messages. BSA is facing an identity crisis, and it may not survive as a unified organization. The tragedy is that children and young men are the primary victims of the inability of “adults” to adjust to a pluralistic society. This entry was posted in Atheists, Boy Scouts, Discrimination by danblinn. Bookmark the permalink. I don’t know if you know this, Dan, but I’m an Eagle Scout and also a leader at the troop and council levels. I’m very conflicted by the culture wars involving the Scouts. Being a Scout did marvelous things for me; I see the benefits to a number of kids, including my son, for being in Scouts. I don’t have a solution, only conflicts. I did know that – and you were one of the people I had in mind when I mentioned the good work that adult Scout volunteers do. A few years ago, I had a long conversation about this issue with a friend of mine who is also an Eagle Scout and whose son recently became an Eagle Scout. He explained to me that there were many who are working hard to change the organization from within. That conversation played a large role in helping me better understand that this issue is more nuanced than I had originally thought.